Smear, Kernechtrot-Picroindigocarmine (KPIC) “Christmas tree” stain. Kernechtrot-Picroindigocarmine (KPIC) “Christmas tree” stained slides for greater contrast. 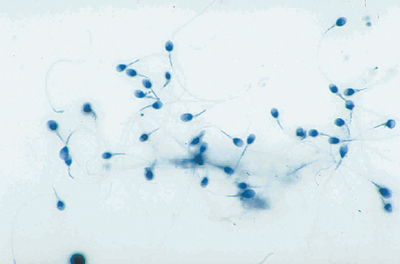 Will show spermatozoa red bodies with the midpiece and tail sections green.